(Bloomberg) -- As Nicolas Maduro steps up his search for cash overseas, another door is slamming shut. The International Monetary Fund suspended the Venezuelan leader’s access to almost $400 million of special drawing rights, citing political chaos since National Assembly President Juan Guaido claimed in January that he was the nation’s rightful leader, said two people familiar with the matter. Venezuela already whittled its SDR holdings down from almost $1 billion in March 2018. The IMF’s caution marks at least a temporary defeat for Maduro’s government as it seeks to gather money held abroad to stave off a devastating economic collapse that could undermine key support from top military commanders. The SDRs represent one of the regime’s last remaining sources of cash. Almost two-thirds of Venezuela’s $9 billion in foreign reserves are in the form of gold, which has been difficult to liquidate because of U.S. sanctions. IMF spokesman Raphael Anspach said he couldn’t comment on the status of SDRs, which are valued against a composite of five global currencies and were established in the 1970s to guard against too much reliance on gold or the U.S. dollar. 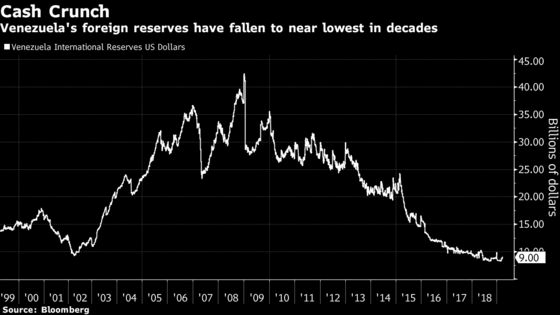 Venezuela has historically used SDRs to bolster its reserves, which have dwindled to near the lowest in decades. Venezuela’s Finance Ministry declined to comment. Central bank spokeswoman Yosendy Chirguita didn’t respond to calls and emails seeking comment. Guaido’s camp has all but declared victory in the battle over who has access to the SDRs. Ricardo Hausmann, a Harvard professor and economic adviser to Guaido, said the IMF is safeguarding the assets until a new government takes over. “Those funds will be available when this usurpation ends,” he said in an interview at Bloomberg headquarters in New York. Whether the IMF will formally recognize Guaido as Venezuela’s leader is an open question. Under the fund’s rules, a government must be recognized by a majority of member countries to access its SDR reserves. Neither Maduro nor Guaido has garnered the requisite support, the people said, speaking on condition of anonymity because they aren’t authorized to comment publicly. In late January, the Bank of England stymied Maduro’s attempt to pull $1.2 billion of gold from its vaults, while the Trump administration handed control of key Venezuelan bank accounts in the U.S. to Guaido. On its website, the IMF lists Maduro’s finance minister, Simon Zerpa, as Venezuela’s representative. The Inter-American Development Bank, by contrast, has recognized Guaido and lists Hausmann on its website as Venezuela’s official delegate. The limbo recalls a crisis in Honduras a decade ago. Back then, the IMF recognized the government of President Manuel Zelaya, whom the military had forced into exile at gunpoint. As a result, the interim government couldn’t immediately tap $163 million in Honduran SDRs to boost its foreign reserves. Venezuela’s relationship with the IMF has long been contentious. In 2007, then-President Hugo Chavez pledged to cut ties with the fund. That plan was never carried out because leaving the IMF risked triggering a technical default in which investors could demand immediate repayment on some bonds. Since then, Venezuela has defaulted on more than $10 billion in payments.